Nanking Cherry is a species of Prunus scientifically referred to as Prunus tomentosa. It is native to the western and northern China including the Tibetan regions, Mongolia, Korea and northern India in Jammu and Kashmir areas. Nanking cherry has other names such as Korean cherry, Shanghai cherry, Ando cherry, downy cherry, Manchu cherry, mountain cherry among many others. Nanking cherry is a deciduous shrub which is irregular in shape measuring between 0.3 and 3 meters in height when it matures. Its bark is copper tinted black and glabrous. Its leaves on the other hand are alternate with a length of 2 to 7 cm and a breadth of 1 to 3.5 cm. Its shape ranges from oval to obovate and has serrated margins. Its color is dark green on the upper side and tomentose on the underside. Its petioles are glandular. This cherry has pink or white flowers in a scarlet calyx. It can either open before or together with the leaves during the spring season. It is a renowned profuse bloomer with the flowers arranged in clusters perched on scarlet pedicels. The diameter of the flowers is 1.5 to 2 cm. during the beginning of summer, Nanking Cherry start producing its fruits. They are sweet but at times they are slightly tart cherry. In diameter, the fruit measures between 5 and 12 mm. 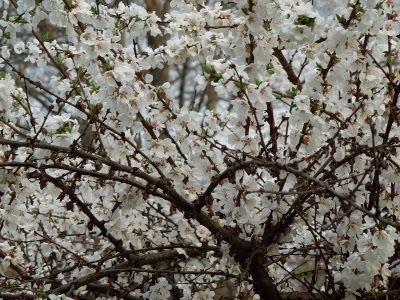 in order to grow and flourish, Nanking cherry prefers full sun. It can grow in a variety of soils and this explains why it is widespread. It has a high survival rate because of its resistant to cold and drought. In eastern Asia, this cherry is cultivated primarily for its fruit and flowers. It was introduced for the first time in the British Isles in the 1870 followed by the United States in 1872 by Arnold Arboretum. Nanking cherry is edible and in many forums, it is used as an ingredient in the making of juice, wine and jam. It is also cultivated as an ornamental plant.